Bigger, better, stronger, faster. It’s a simple mantra spoken by many performance enthusiasts. When it comes to increasing an engine’s performance, making it bigger (increasing displacement), better (more efficient), stronger (capable of sustaining higher power output) and faster (capable of higher peak RPMs) is a solid plan to follow. 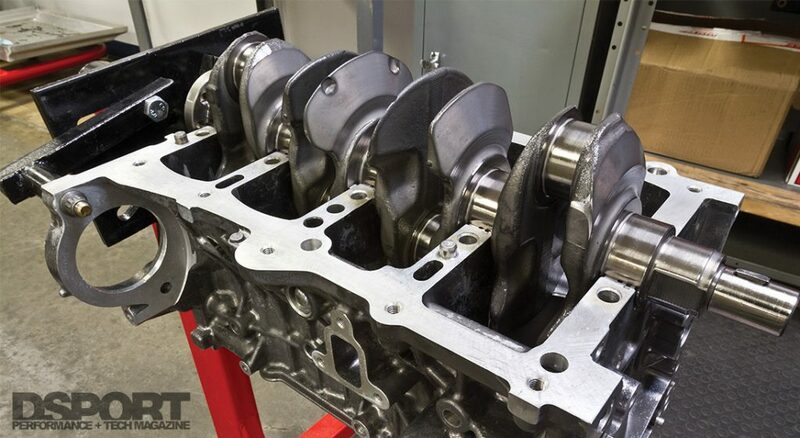 While there are a number of aftermarket companies that offer the stroker kits and valvetrain upgrades to build a “B.B.S.F.” engine, there are times when one may want or have to engineer solutions from scratch. Custom crankshafts, custom pistons and custom rods are sometimes the only path for a specific goal. 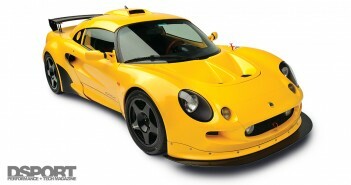 When DSPORT initiated its Project Elise back in 2005, there weren’t any “kits” to make the Lotus’s Toyota 2ZZ-GE engine bigger, better, stronger and faster. Fortunately, we engineered a solution that we will soon be putting to the test. Increasing an engine’s displacement directly increases an engine’s torque output. The torque increase is proportional; meaning that a 10-percent increase in displacement should result in a 10-percent increase in peak torque output, all other factors being equal. To increase an engine’s displacement, the bore and/or stroke of the engine must be increased. In the case of the Toyota 2ZZ, increasing the bore of the engine is not a viable option. Toyota engineered the engine without cylinder liners. Instead, a Metal Matrix Composite (MMC) preform containing alumina-silica and mulite particles is die cast to the aluminum cylinders. This is finished by electrochemical machining. While it is possible to machine a 2ZZ block to accept aftermarket ductile iron sleeves, the limited bore spacing (only 5.5mm between each cylinder) of the 2ZZ block doesn’t allow for the sleeves to be opened up beyond 82.5mm. Since our power target is in the 400~500 horsepower range, we shouldn’t require the additional strength of aftermarket Darton sleeves. Hence, we opted to stick with the stock block and bore size. 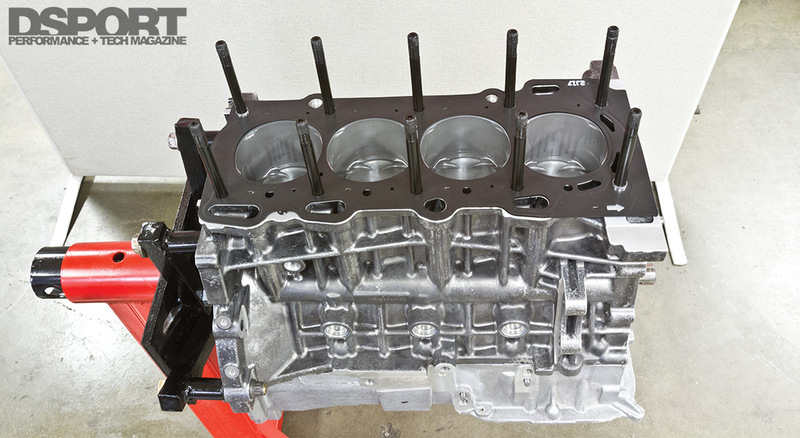 We sourced a new short block from Toyota as it was just a few dollars more than a bare block and stripped it down for the build. Since we are keeping the MMC cylinders in place, a piston with a compatible coating is required. Mahle is one of the piston companies that offers such pistons. Since increasing the bore was not an option, we focused attention on increasing the stroke of the engine. After doing a bit of research, we learned that the 1ZZ-FE engine uses a +6.5mm longer stroke crankshaft than the 2ZZ. Measuring in with a stroke of 91.5mm versus just 85mm, the 1ZZ’s additional stroke takes the displacement of a 2ZZ from 1,796cc to 1,933cc. This displacement increase of 7.65 percent delivers a torque increase of the same magnitude. While less expensive than a custom crankshaft solution, using a 1ZZ crankshaft in a 2ZZ engine is not a drop-in affair. While the main journals are the same spec, the rod journals, counterweight radius, rear flange and front snout are slightly different. The 1ZZ’s rod journals are 1mm smaller in diameter. As a result, a custom connecting rod is required to match the smaller diameter rod journals. In addition, the connecting rod must also be shortened from the 2ZZ spec to work with the longer stroke of the 1ZZ] crankshaft. Since the stroke of the 1ZZ crankshaft is 6.5mm longer than a 2ZZ crankshaft, using a connecting rod of the original 2ZZ length with a standard 2ZZ piston would result in the piston protruding 3.25mm (half of the stroke increase) out from the deck of the block when the piston is at Top Dead Center (TDC). 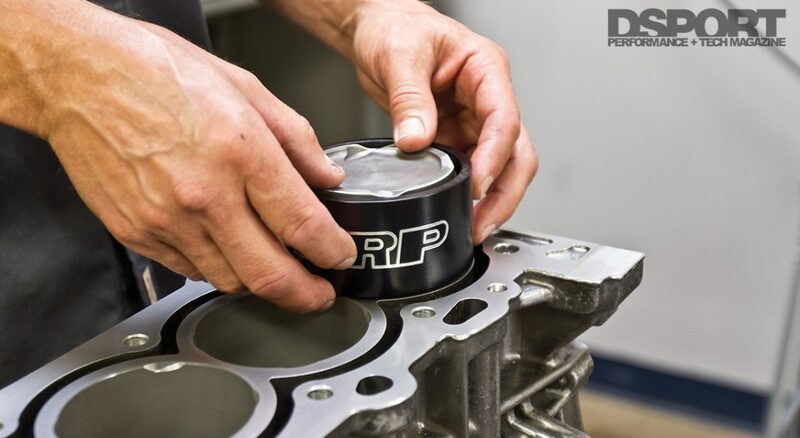 To properly locate the piston at TDC, a total of 3.25mm must be addressed through shortening the connecting rod and/or raising the location of the wrist pin within the piston. Our custom Mahle pistons moved the piston pin location up 1.928mm by changing the compression height from 31.2mm to 29.272mm. According to Mahle, this was the highest pin position they recommended in order to still have enough piston strength for our compression ratio and power targets. That left us with 1.322mm (3.25mm – 1.928mm) that would need to be addressed with the rod length. We specified a center-to-center length of 136.70mm for the custom Crower rods, a total of 1.30mm shorter than the original 2ZZ rods. This left the piston just 0.022mm or 0.00087-inch higher in the bore which was perfect to achieve a zero deck height. While custom rods and pistons provided solutions for the smaller rod journals and increased stroke, the 1ZZ crankshaft also needed to be properly cut down and knife-edged to provide clearance for the oil squirters and piston skirts (remember the piston is also going down in the bore an additional 3.25mm due to the increase in stroke). Of course, these crankshaft modifications require that the crankshaft is rebalanced after the machining operations. With three out of the five hurdles cleared for using a 1ZZ crankshaft in a 2ZZ block, MonkeyWrench racing would provide the proper rear seal adapter and snout spacer for the 1ZZ crankshaft. The MonkeyWrench racing rear main seal adapter allows the 1ZZ rear main seal (which is smaller in outside diameter) to be properly fitted in a 2ZZ block. The spacing washer for the front of the crankshaft properly locates the lower timing chain gear on the crankshaft snout. 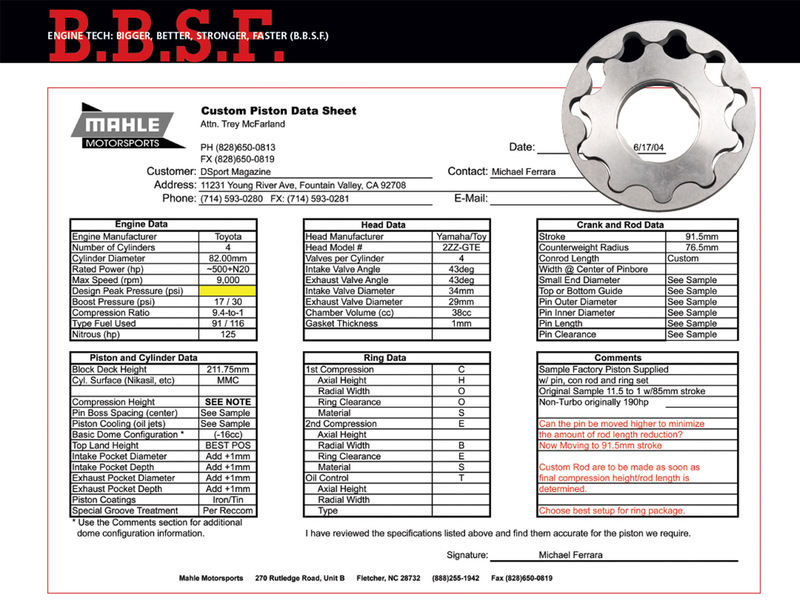 Since the 1ZZ crankshaft has a different bolt pattern for the flywheel, we selected a lightweight AASCO aluminum flywheel to match the flywheel bolt pattern on the crank. If all that sounds a little too confusing, there are now alternatives. MonkeyWrench racing offers a 2.0-liter stroker kit (93.5mm stroke) that utilizes a custom billet crankshaft and custom pistons with a 26.95mm compression height. Since the pin is located in the oil rail portion of the piston, rail spacers (included) must be used. The MonkeyWrench Racing stroker kit is compatible with stock or aftermarket 2ZZ rods. A 1.475:1 rod ratio is achieved with a final displacement of 1975.4cc (10.0 percent increase) with this system. Honda’s B-series VTEC engine was coined “the engine that started a REVolution” when it earned the number one designation in DSPORT’s “10 Best Engines” evaluation. Capable of exceptional horsepower-per-liter in both naturally-aspirated and turbocharged trim, Honda’s VTEC system led the way in educating performance enthusiasts about the advantages of variable lift and camshaft timing technology. While Honda threw the first punch, Toyota countered five years later with an exceptionally capable 1.8-liter engine of its own, the 2ZZ-GE. The 2ZZ-GE introduced Toyota’s VVTL-I technology which delivered the same advantages of Honda’s VTEC system while also delivering computer-controlled intake camshaft phasing (similar in effect to Honda’s iVTEC). While more displacement is always a good thing, there are two areas of concern when an engine’s stroke is increased. First, increases in stroke also result in an increase in piston speed. If you are increasing the amount of distance that the piston travels up and down the cylinder by changing the stroke, it must travel at faster speeds to make this journey at a given engine speed (RPM). The factory 2ZZ engine uses forged rods and cast pistons to reach a peak mean piston speed of nearly 4,600 feet per minute (fpm) at its 8,200 RPM redline. For comparison, Toyota uses non-forged rods and cast pistons on the 1ZZ engine and limits piston speed to just below 4,100 fpm at that engine’s redline. 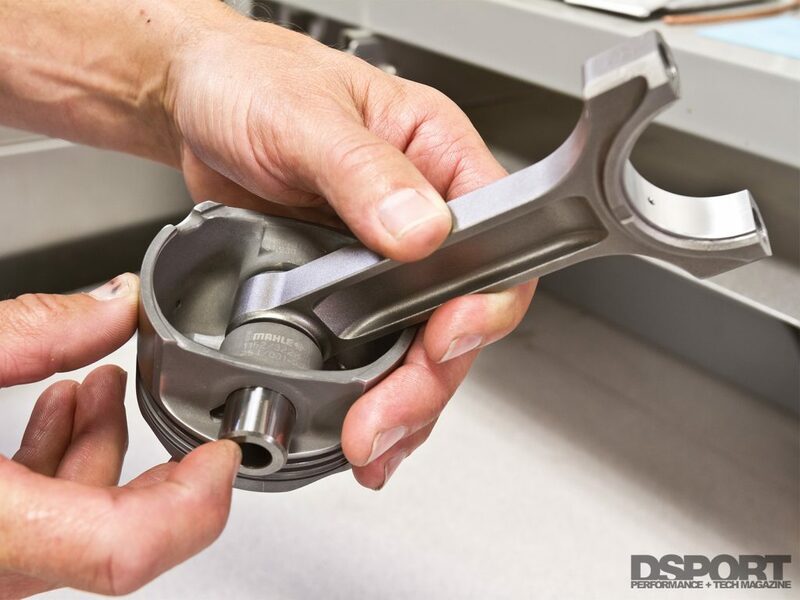 With high-quality aftermarket connecting rods and forged pistons, mean piston speeds around 5,400 fpm are acceptable. That will be the target with our engine. The second concern with increasing an engine’s stroke is the change to the ratio between the length of the rod and the length of the stroke. In the case of the 2ZZ engine, the factory utilizes a 1.62:1 rod ratio. Our combination has a shorter 1.49:1 rod ratio. 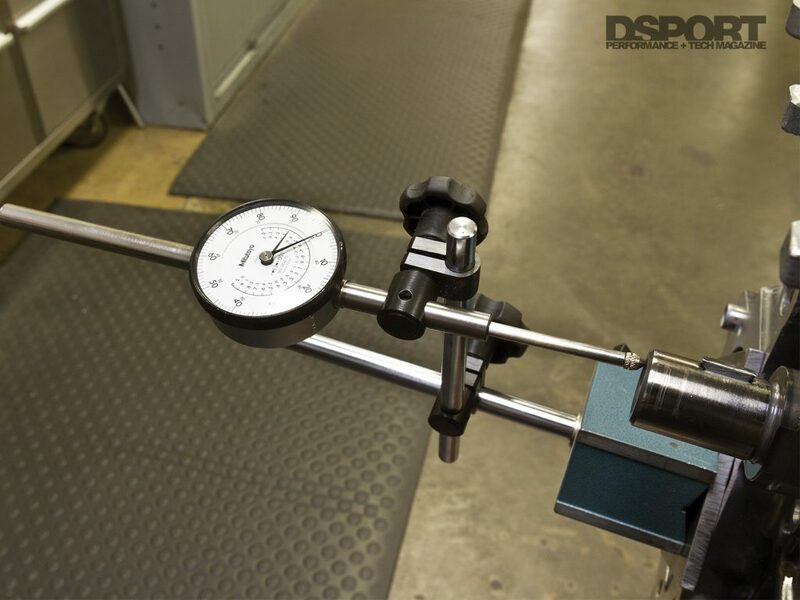 In theory, a shorter rod ratio will help low and mid-RPM performance while sometimes sacrificing top-end performance. However, when we tested a short rod versus long rod B-series Honda, we made more power across the entire power band with the shorter rod ratio. While the performance advantage or disadvantage is unpredictable, a shorter rod ratio will increase the rod angles when the piston is traveling between TDC and BDC. As a result, the side loading on the piston will be increase. However, when performance aftermarket pistons are used in place of stock pistons, the reduced skirt area should compensate and not cause any additional cylinder wear. Tapered ring compressors are the ONLY way to go for installing pistons. Since MMC cylinders cannot be honed to a fresh finish, reducing the wear on the cylinders must always be a consideration. Unfortunately, the gasoline sold in the U.S. has a history of very high sulphur content. Between 2004 and 2007, gasoline may have had sulphur levels as high as 450ppm. Before that, the level may have exceeded 1000ppm. At levels of 1000ppm, the ring wear rate will be 10 times the wear rate at 100ppm. If your 2ZZ engine has a lot of miles from that time period, the wear in the cylinder may be excessive. Today, the upper limit for sulphur content in gasoline sold at the pump is a much lower 95ppm. For comparison, Japan’s premium unleaded has consistently measured under 50ppm. So what’s the problem with sulphur? Sulphur in the fuel forms acid on the cylinder walls during warm up. This acid eats away at the MM surface and the piston rings. The amount of acid in the bore increases when coolant temperatures are low. 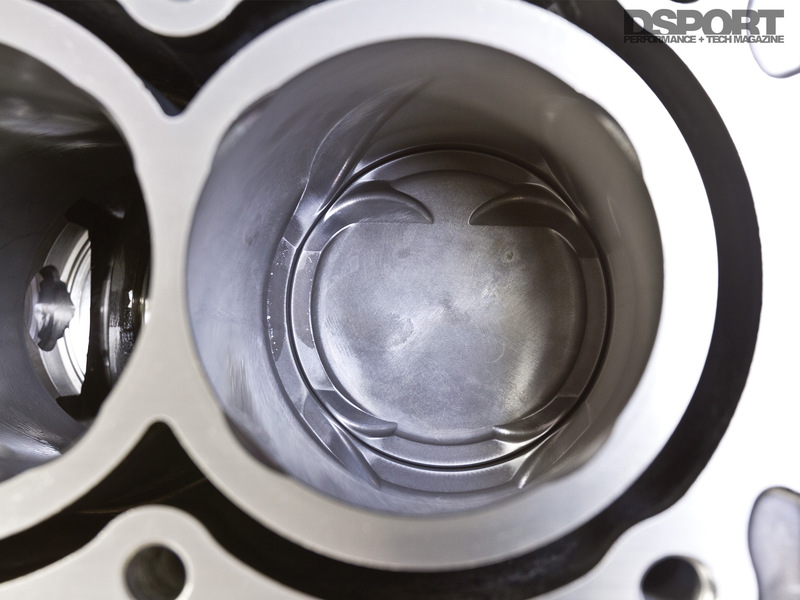 The increased acid amount eliminates the oil film between the piston rings and cylinder. As such, wear increases. The key to extending the life of the rings and cylinders in an MMC engine is to keep load at a minimum until the engine reaches 176 degrees Fahrenheit (80 degrees Celsius). It’s also important to let the engine warm up as quickly as possible. Running no thermostat, using a thermostat that opens below the 176 point or triggering the cooling fans too early will simply increase cylinder and ring wear. At 176 degrees, the ring wear rate is less than 10 percent of that when the coolant is only at 75 degrees. So before you stomp on that pedal, get it hot. In terms of engineering a performance engine to be “better” or more efficient, compression ratio, cylinder head flow performance and camshaft timing take the lead. Increasing an engine’s compression ratio increases the thermal efficiency of the engine. A higher thermal efficiency means more energy is extracted from each drop of fuel during the combustion process. The 2ZZ engine sports a high 11.5:1 compression ratio from the factory as part of its strategy to delivery exceptional fuel economy. Of course, these high compression ratios require the highest-octane fuel available from the pump. Since we are planning to turbocharge our stroked 2ZZ engine, we had to select a compression ratio that would be boost friendly. Ultimately, we ended up at 9.8:1 with our custom Mahle pistons and OEM Toyota MLS head gasket. While this reduction in compression ratio accounts for a 4.0-percent reduction in thermal efficiency, the lower compression ratio is necessary to be able to run forced induction on pump gas. While thermal efficiency is reduced with a lower compression ratio, there is a performance benefit as the total displacement volume (combustion chamber volume and dish volume) is increased. In the case of our combination, we went from having a total displacement volume of 46cc to 54.9cc. The 8.9cc of additional volume delivers the same benefit of having 1.84 percent more cylinder displacement. Hence the total performance drop from the compression ratio drop is just a loss of 2.2 percent. This slight loss will easily be masked by the turbocharger system that will be able to run higher boost levels for more power, thanks to the lower compression ratio. 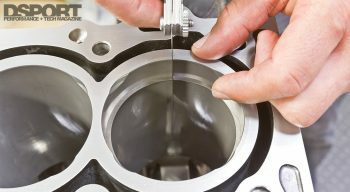 Since we also optimized the quench clearance to the thickness of the 1mm head gasket, we should also have a combination that delivers the highest resistance to knock. 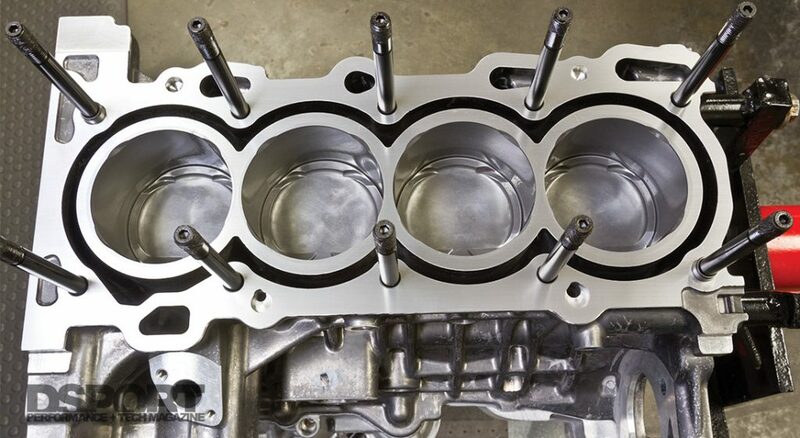 Toyota’s factory multi-layer-steel (MLS) head gasket is well engineered. The factory MLS head gasket is capable of containing the increased cylinder pressure of forced induction duty. 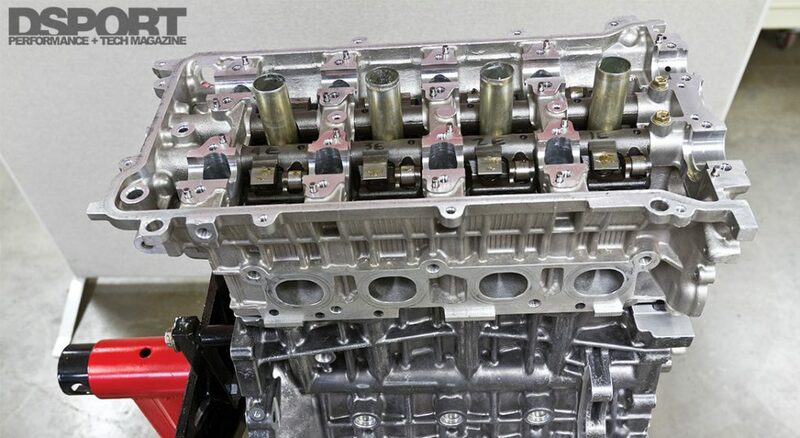 The quality of the design of the cylinder head’s ports dictates the volumetric efficiency of the engine. In the case of the 2ZZ engine, Toyota contracted Yamaha to design a cylinder head with exceptional flow characteristics. The port designs coupled with Toyota’s VVTL-i system results in stellar flow performance that, in turn, deliver exceptional volumetric efficiency for the engine. Our plan was to simply optimize a great flowing cylinder head by performing only a pocket port and competition valve job. While the factory head already outflowed the benchmark B16 VTEC head, the pocket port and competition valve job increased flow performance without reducing the velocity of the flow. Comparing the stock 2ZZ head to the B16 cylinder head, the average intake flow improvement is 5.5-percent with the average exhaust flow being nearly identical (B16 better at low lifts, 2ZZ better at high lifts). 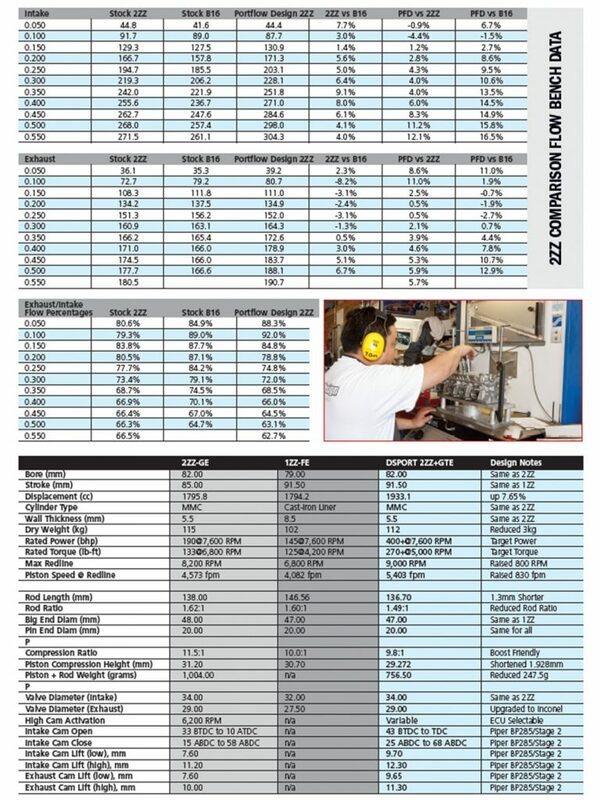 With the pocket port and competition valve job performed on Port Flow Design’s (PFD) Newen valve seat cutter, the PFD head showed an average intake flow improvement of 4.4-percent over the stock 2ZZ head (10.2-percent over the stock B16 head). On the exhaust side, the PFD 2ZZ head had an average exhaust flow improvement of 4.4 percent over the stock 2ZZ head or 4.6-percent over the stock B16 head. Piper Cams offers three different grinds for the 2ZZ engine. We selected the mid grind called the Ultimate Road. 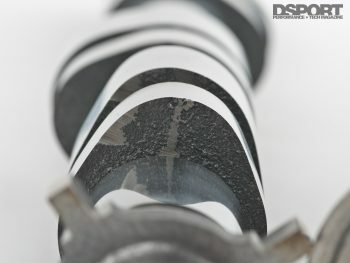 Since the camshafts orchestrate all of the valve events in sync with the position of the piston, upgrading to a set of aftermarket camshafts that lift the valves higher and open the valves longer is one way to optimize the volumetric efficiency of the engine within a set range of engine speeds. While Piper Cams may not be a familiar brand in America, they are one of Europe’s most popular performance camshaft manufacturers. We opted for the BP285 grind which is also know as the “Ultimate Road” camshaft. A great grind for both naturally-aspirated and forced-induction applications, MonkeyWrench Racing has seen power gains across the powerband with peak power gains of over 15 horsepower (187.5whp versus 170.0 whp). 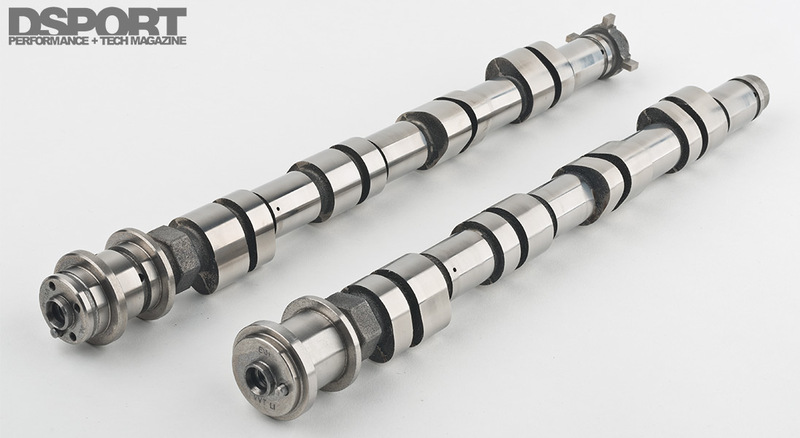 Due to the higher lift from these camshafts, upgraded valve springs are a must. Taking an engine that originally produced 190 horsepower at the flywheel and then expecting it to live a happy life producing 400 to 500 horsepower obviously requires some upgrades. Our parts combination has improved the materials and designs of a number of the most stressed internal components. The factory cast pistons have been replaced by Mahle forged pistons. These 2618- alloy aluminum forged pistons are superior in strength and not prone to failure at the increased cylinder pressures and temperatures encountered at the higher power levels. In addition, these stronger pistons have a much higher tolerance to detonation that can occur when an ECU calibration is off target. Likewise, the Crower 4340 steel connecting rods are also significantly stronger that the factory connecting rods. The additional clamping force delivered by the ARP main and head studs also ensures durability with the increased power loads. 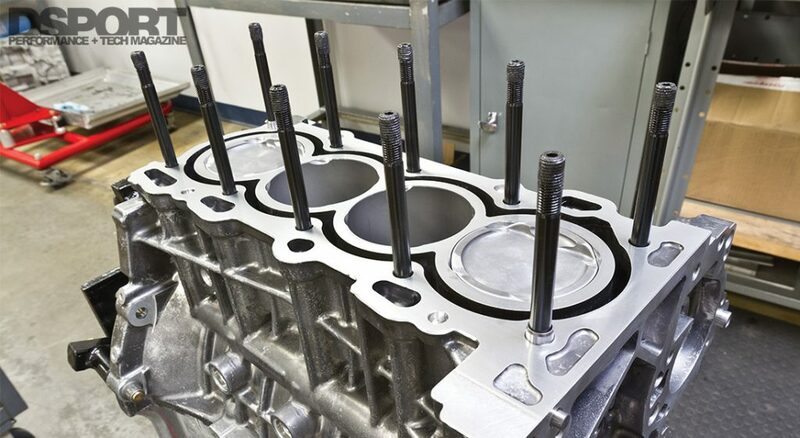 In the cylinder head, the Supertech black nitride, stainless-steel intake valves and Inconel exhaust valves offer superior strength compared to the alloys used in the factory valves. When combined with the upgraded Eibach valve springs and Supertech titanium retainers (require modification when Eibach valve springs are used), the cylinder head is ready for the increased temperatures and stresses that can be encountered with turbocharging and the multiplication of power over the factory levels. Spinning the engine safely to 9,000 RPM requires that both the rotating assembly and valvetrain are up to the challenge. Considering that the superior materials and design of the Mahle pistons and Crower rods allowed for a reduction of almost 250 grams from each piston and rod combination, the engine now benefits from reduced loads. While taking our stroked 2ZZ to 9,000 RPM means that peak piston speeds are now increased by 18.2 percent, we were able to reduce the total mass of the piston-and-rod combination by almost 25 percent. As for the valvetrain, the Eibach valvesprings, Supertech titanium retainers, Supertech valves and Piper Cams all provide superior performance over the factory components at higher engine speeds. The increased spring rate of the Eibach valve springs and reduced mass of the Supertech titanium retainers work with the profile of the Piper Cams to eliminate valve float. Some machining of the Supertech retainers is required when used with the Eibach springs. 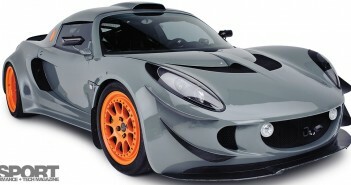 The Supertech retainers require no machining when used with the Supertech springs. Proper clearance must be set on both the “low” and “high” lobes on the cams. Not everyone has a machinist and engine assembler with Formula One and Champ Car experience, but we are fortunate enough to have Magnus Ohlaker running our in-house machine shop. With the 2ZZengine, honing of the cylinder bores is not recommended. Instead, measurements of a used block or the use of a new block is required (if the used block is out of spec). All other machining operations are required. When a 1ZZ crankshaft is used, it must have its radius turned down and counterweights knife-edged for clearance before balancing. Used blocks should also have the deck of the block precision surface ground or lapped to a low Ra finish for proper head gasket sealing. Pistons rings should be file fit to deliver the desired clearances for reduced leakdown. Beyond that, performance assembly measurements to properly set crankshaft thrust clearance, bearing clearances, ring end gap clearances and the like must be made. Before the end of this year, we plan on having this engine installed in our Project Elise with an aftermarket engine management and turbocharger system in place. After a dyno session or two, we look forward to more than doubling the power output. Having over 400 horsepower at the wheels in a 2,000-pound vehicle should prove to be quite a ride. Stay tuned.